U.S. EPA this week published a significant rule to reduce mercury runoff from dental offices. President Obama's EPA issued the rule last December, but the Trump administration withdrew the regulation before it was published in the Federal Register. Then the Natural Resources Defense Council filed a lawsuit accusing EPA of illegally rescinding the rule without providing a public comment period (Greenwire, Feb. 2). "The agency decided to reissue the rule instead of defending in court the decision to withdraw it," Margaret Hsieh, an attorney on NRDC's litigation team, said in a statement last week. "Protecting the public — and not responding to a lawsuit — should have been motivation enough for this sensible action." What remains to be seen is whether EPA plans to offset the cost of the mercury rule by repealing two old rules as required by Trump's Jan. 30 executive order. The order requires agencies to identify two or more rules whose repeal will pay for a single new one. EPA did not respond to requests for comment by press time. While the runoff rule was crafted under Obama, the Office of Management and Budget's guidance on Trump's order states that it applies to all significant rules issued after Jan. 20, 2017. "I'm curious how the OMB lawyers would define 'issued,'" Sofie Miller, a senior policy analyst at the George Washington University Regulatory Studies Center, noted on Twitter. Ultimately, OMB Director Mick Mulvaney and the Office of Information and Regulatory Affairs director will decide whether EPA needs to offset the cost of the rule. Waiting in the wings is Neomi Rao, whose Senate confirmation to lead the White House regulatory shop is pending with a vote set for next week. If confirmed, as is expected, she and Mulvaney would also have the power to grant waivers to the two-for-one requirement, should they choose. Sam Batkins, director of regulatory policy at the right-leaning American Action Forum, said the answer will likely come next week or the following with the release of the Unified Agenda. "We won't know formally until the Unified Agenda is released and EPA identifies [the rule] as recently completed," he said. Under the Regulatory Flexibility Act of 1980, agencies are required to note all planned federal regulations to be published in the Unified Agenda. The agenda is expected "soon," Batkins said. The latest the document has been released was July. In theory, Batkins said, each agency will lay out both the rules it intends to promulgate this year and also the rules it intends to repeal as offsets. If EPA plans to roll back rules to pay for the new mercury regulation, the agency will document it in the Unified Agenda. The new rule is intended to reduce dental office discharges of mercury up to 5.1 tons annually through the use of amalgam separators. Dentists use amalgams that can be up to 50 percent mercury to do teeth fillings. When patients rinse their teeth during the process, mercury is flushed down the drain. Mercury is a neurotoxin that has been linked to immune, digestive and respiratory issues. 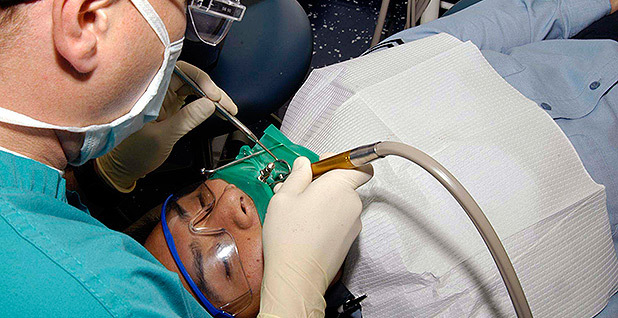 The American Dental Association has worked with EPA on the rule for several years, and commended the agency for "a fair and reasonable approach to the management of dental amalgam waste." Many city and county water districts left comments on the rule docket. David Williams of Bay Area Clean Water Agencies argued that the rule could require more work for the member agencies' pretreatment programs to provide a "minimal environment benefit." Carolyn Fiore of the Massachusetts Water Resources Authority reiterated those local concerns. Massachusetts has used a statewide program with similar requirements for 10 years, and compliance is very high, according to Fiore. "In Massachusetts, as in other states with state-wide programs, there will be no additional environmental benefit to be gained with the imposition of these requirements on individual EPA-approved Industrial Pretreatment Programs, but there will be additional costs that will be borne by each [Publicly Owned Treatment Works]," she wrote.